(Photo: REUTERS / Tony Gentile)Pope Francis waves as he leaves at the end of his weekly audience in Saint Peter's Square at the Vatican October 1, 2014. Showing growing concern for Middle East Christians, Pope Francis has called for a discussion on their worsening plight at an upcoming consistory for focussing on new saints. In an October 8 briefing, Vatican spokesperson Father Federico Lombardi said the consistory - a formal meeting of cardinals and patriarchs sought by the Pope - was scheduled for October 20. That is the day after the extraordinary Synod of Bishops on the Family ends. 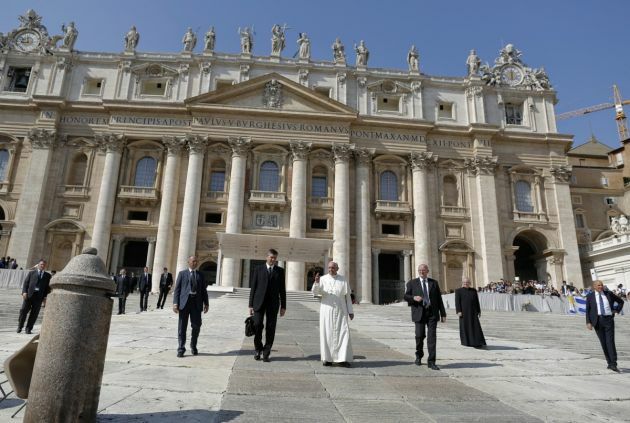 "The consistory's topic is now widened, and it becomes a consistory during which all cardinals and patriarchs will speak about the situation in the Middle East," Lombardi said. Cardinals at the synod had been informed about the expanded consistory by Cardinal Angelo Sodano, dean of the College of Cardinals. Popes usually call a consistory when important matters such as canonization of saints or the creation of new cardinals are slated to be discussed. In certain instances, a pope may also make an announcement relating to the life of the Church during the meeting. Vatican Secretary of State Cardinal Pietro Parolin is expected to "introduce the discussion, and then cardinals will speak about the topic," said Lombardi. In an interview with the Catholic News Agency, Archbishop Silvano Tomasi the Vatican envoy to the United Nations in Geneva recalled the spirited debate during the meeting from October 2 to 4. There church officials contemplated ethical solutions on solving "the problem of the violence in Middle East and to avoid genocide." "The international community needs to find the most effective way to stop the violence using the mechanisms the international community has entrusted itself with, like the United Nations, the Security Council of United Nations, and humanitarian agencies," Tomasi noted. It was clear during the discussion that the necessity of ending the war is very urgent, said Tomasi. But how the international community would end the war failed to deliver an answer. "Given this, we should also ask what kind of solidarity is needed to stop the violence, beyond the delivery of water, food, and supplies," Archbishop Tomasi said.